A priest fought back tears Tuesday as he paid tribute to his nephew Joseph Cummins, who was murdered last weekend. The popular 21-year-old rugby player was laid to rest at Ballinaneasagh cemetery near Waterford yesterday, three days after he was killed at a rented property on Lower Grange Road in the city. The victim, from the Willows, Cairnwood, in Co Waterford, died after being stabbed several times at the house, which is near St John's Park. A relation of former Lord Mayor Stephen Rogers, Joseph had been planning to return to live with his parents in Tramore after living in the city centre for some time, it emerged yesterday. Hundreds turned out to bid an emotional farewell to a beloved friend. His pals remembered him as an outgoing young man who lived for dance music and who was a "huge Johnny Cash fan". His parents, Joe and Theresa, were consoled by Joseph's sister Dawn (29) and brothers, Paul (26) and Niall (18). 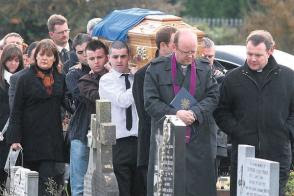 During his homily at the burial ceremony in the Holy Cross Church, Tramore, a visibly upset Fr Tom Rogers, Joseph's uncle, said: "None of us should be attending the funeral of a 21-year-old man. But that is the sad truth," he added. He described Joseph as a "tall, attractive and athletic young man" whose death is a "loss to international rugby". Gardai say their investigations are ongoing and they are following definite leads.